GATE Admit Card 2019 | Check Rejected & Accepted Candidate List OUT ! 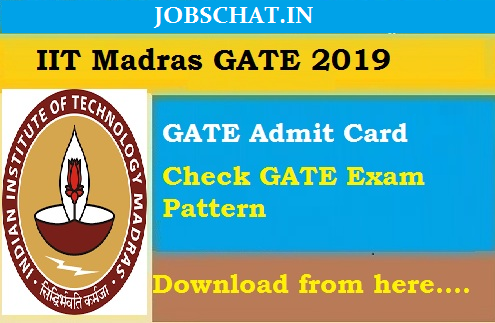 GATE Admit Card 2019 is released by the Indian Institute Of Technology, Madras (IITM) for the Graduate Aptitude Test In Engineering – 2019 applied aspirants. So, the exam attendees of GATE should take a copy of the Graduate Aptitude Test Engineering 2019 Call Letter from the site gate.iitg.ac.in which is available and should attend the exam on respective dates insisted. GATE 2019 Rejected & Accepted Candidate List OUT !!! Latest Update On (03rd December 2018): The officials of Indian Institute Of Technology, Madras (IITM) has released the GATE 2019 Rejected & Accepted Candidate List. So, aspirants check them from here. Graduate Aptitude Test Engineering 2019 Hall Ticket: Good News for the Graduates who are attending the GATE 2019 Online Exam. IIT Madras Officials which is going to conduct this GATE Exam announced the Graduate Aptitude Test Engineering Admit Card 2019 for the employed candidates. Every Year a lakhs of aspirants will attend the GATE Exam all over India for doing their M.Tech in Top IIT and NIT Colleges. Those aspirants should qualify in GATE which is mandatory for doing their higher studies in prestigious Institutions. The GATE Call Letter 2019 is available from 04th January 2019 on the site gate.iitg.ac.in along with www.jobschat.in where it provides all the Educational Information along with the Jobs info for all Degree/ Graduate holders. So, the Graduates who applied for this GATE Online Examination in Septemeber 2018, can get their GATE 2019 Admit Card on the main site. IIT Officials also intimated the List of rejected aspirants who not provided their details while applying. The Aspirants should download this GATE 2019 Hall Ticket by entering the Required info asked by the authorities. As the exam for the Respective Engineering Branches from 02nd, 03rd, 09th & 10th February 2019, aspirants must be fast enough during the downloading because the link will be active before the GATE online Exam only. And along with the GATE Admit card aspirants also needed to carry the List of Original Identity Proof noted for verification purpose. And the graduates can also find the Latest Bank Jobs along with State Govt Recruitments. Graduated Candidate can get the complete Info about this GATE 2019 Exam Date mentioned clearly for their Branch. GATE 2019 Candidate Login link is noted at the bottom for downloading the GATE Admit Card. On that day, he should attend the exam on respective dates allotted to them. And they should reach the exam centre on time because they need to attend the biometric verification done by the Authorities. Just simply keep on preparing the GATE 2019 Syllabus and attend the MOCK Exams by using the link insisted on the main site gate.iitg.ac.in. And the GATE 2019 Results will be announced in the month of March 2019 and counselling for higher studies will be revealed soon on this site. Just bookmark this www.jobschat.in site pressing “ctrl+d”. Candidates can carry any one of the Original ID Proof i.e to the exam of GATE. On Home Page, find GATE Hall Ticket Link to download. Then Open it in a new tab and Enter the required details o Email ID or login id and password along with Captcha code. Finally, check and download the GATE Admit Card 2019.